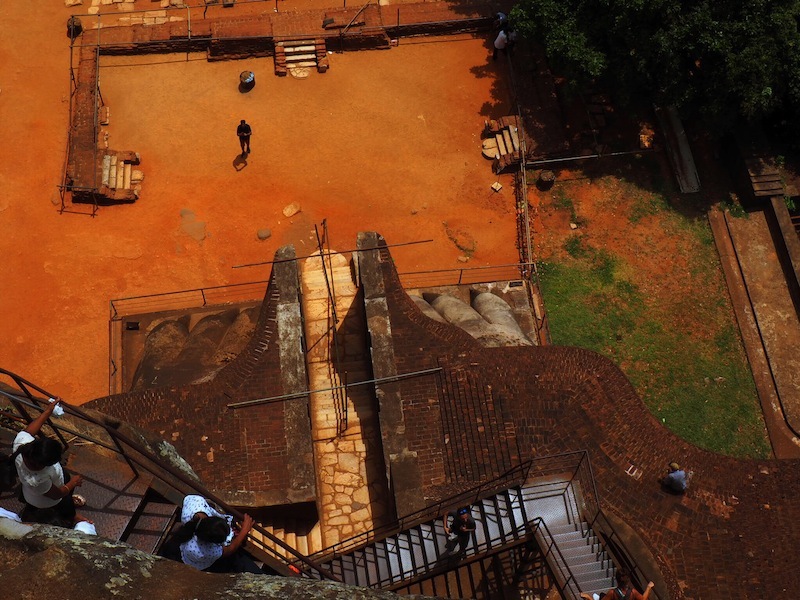 Sigiriya is dual-listed by UNESCO for both its natural and historical attributes – just like Uluru which it reminds me of because of its dazzling orange hue. 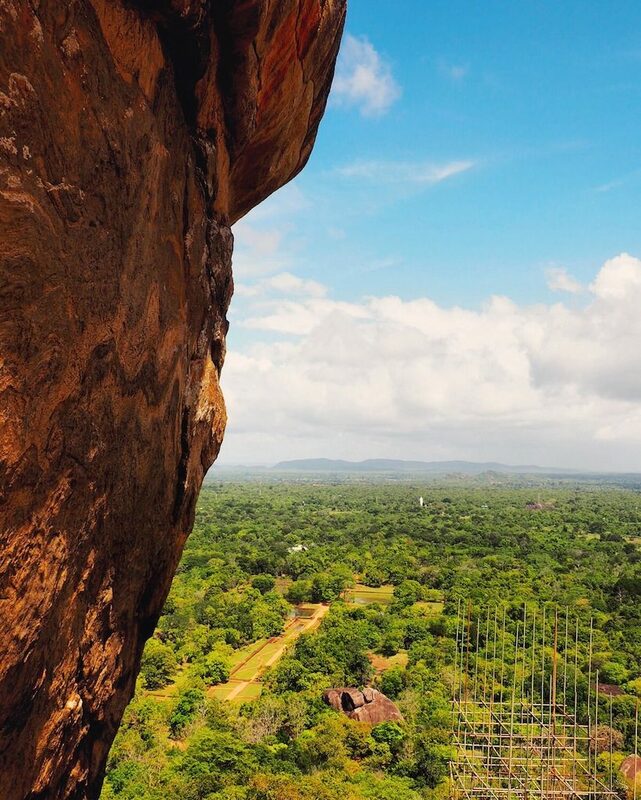 But while visitors are banned from climbing Australia’s sacred rock, you are welcome to climb Sigiriya to discover the ancient ruins of a palace which once sat atop the rock. 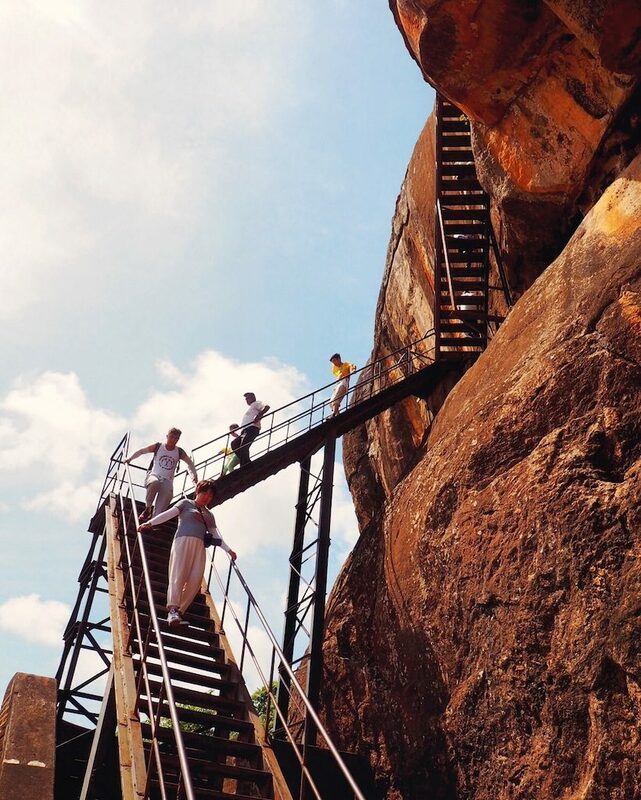 Peering up at the steep rock and uneven steps from the ground it can seem a little intimidating but this climb is suitable for all ages and fitness levels – as evidenced by the young and elderly tourists we witnessed tackling it. Me gearing up to face the rock! I’d recommend you set aside at least 3 hours for your visit as there is lots to admire, learn and photograph along the way. 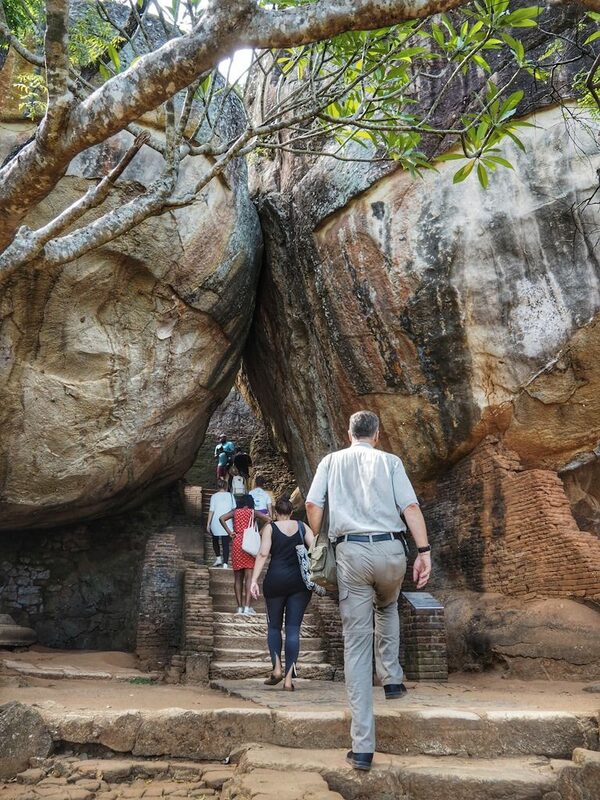 Some visitors report climbing Sigiriya in just 45 minutes but I found that taking it slowly was much more rewarding. There are stairs the whole way up, some made from metal and some carved from stone, so you needn’t be the most adepter hiker to have a go. The last section is probably the steepest and most sketchiest, though, so if you do suffer from vertigo you might want to skip this part out. Stick your head in the museum before you start. 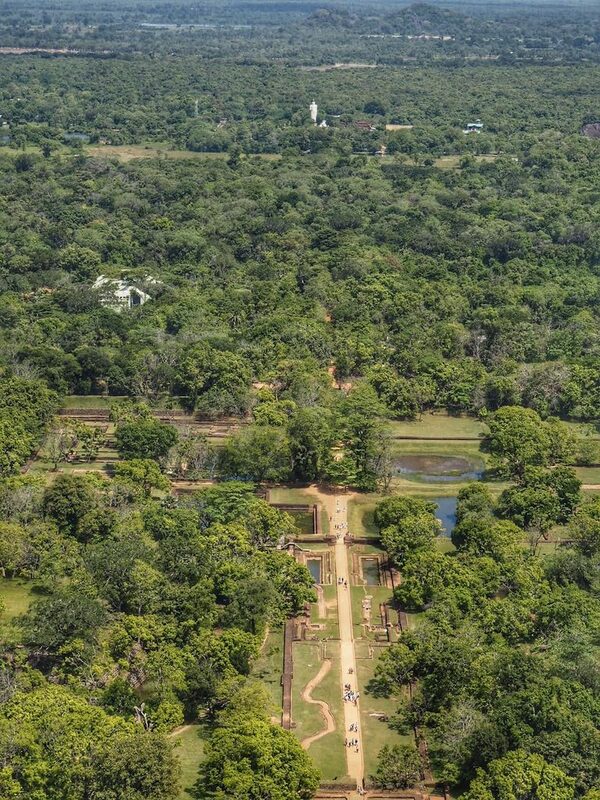 It offers great insight into the history of Sigiriya, including a large-scale model of what the palace would have looked like all those years ago. Note: This will be your last chance to use the loo until you get back down again! Hold onto your ticket. 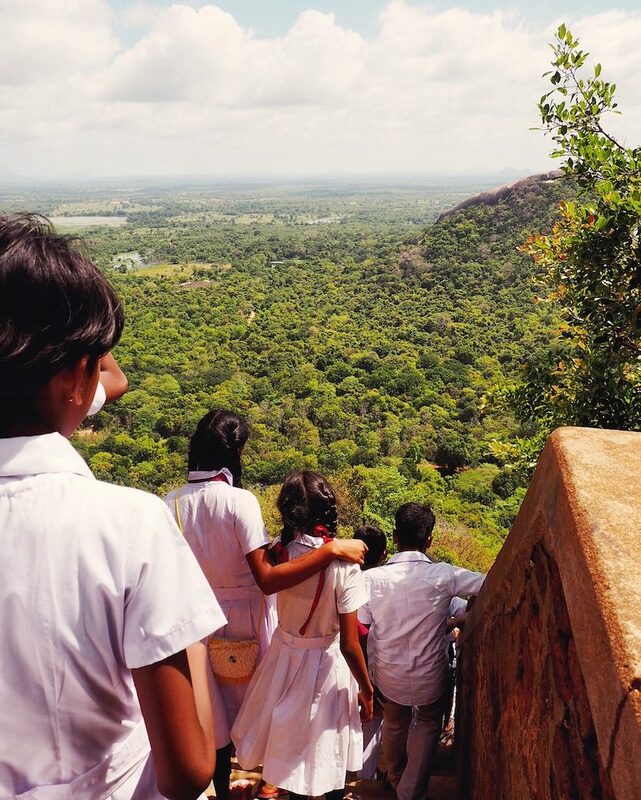 You will need to purchase a pass to climb Sigiriya which costs $30. You’ll need to show it before you enter the water gardens so keep it handy. Awesome place for a field trip! Wear sturdy shoes. This might sound obvious but you will need decent walking shoes to do the climb. You’ll see locals (including schoolchildren) wearing anything from pumps to flip-flops but I felt much more comfortable on some of the slippery stone sections with some proper grip underfoot. Break it into sections. There’s no need to rush to the top – just enjoy the climb. And take much-needed breaks whenever you feel like it along the way. I recommend a little drink stop before you attempt the last (steepest) section through the Lion’s paws. No photos at the mirror wall. You can take photos at any point along the climb apart from in the cave with the frescoes and the famous ‘mirror wall’. This is a shame but I get we have to protect these things for posterity. Take an umbrella for shelter at the top. There’s no protection from the sun at the summit so remember to wear sun protection (even on a cloudy day – Jayne!) and take a small umbrella for extra protection on clear days. Bring lots of water. There’s nowhere to buy any once you start the climb so take enough to keep you going until you get back to the car park. Watch out for the ‘helpers’. 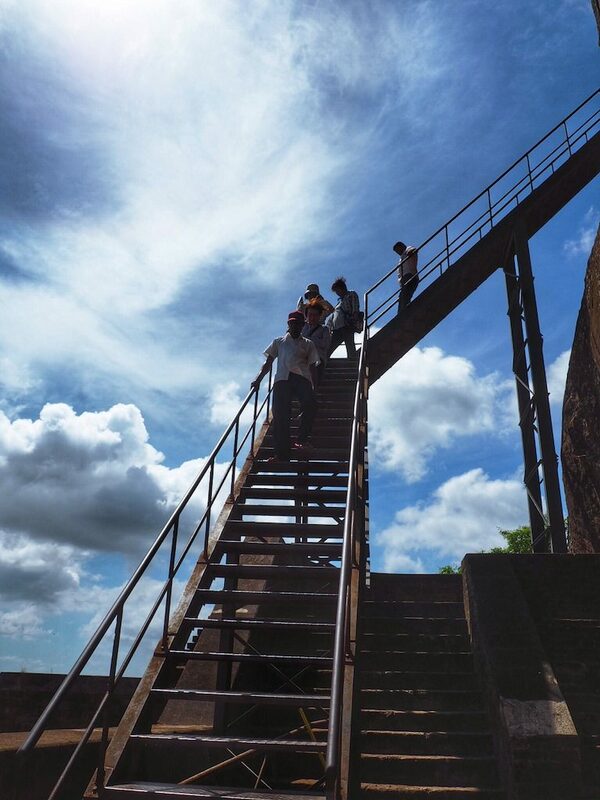 Some gentlemen may try to help you with the steep steps at the start of the climb and then latch themselves onto you as a guide for the rest of the way. If you’ve been to the museum to learn the history though you don’t need a guide to climb with you as the pathway is clearly marked. Just a polite no thanks and a shake of your shoulders (if they happen to grab you there) will be enough to let them know you’re good to go solo. Follow signs for ‘foreigners exit’. There is a quicker way out than going back past the museum. Follow the signs for the ‘foreigners exit’ and you’ll be led out via a few souvenirs stands and some stalls with cold drinks. Avoid the heat around midday. Because this is a moderately difficult climb with no protection from the elements it’s just common sense to go early or later on in the day. It’s best to spend the hottest part of the day by the pool if you ask me! 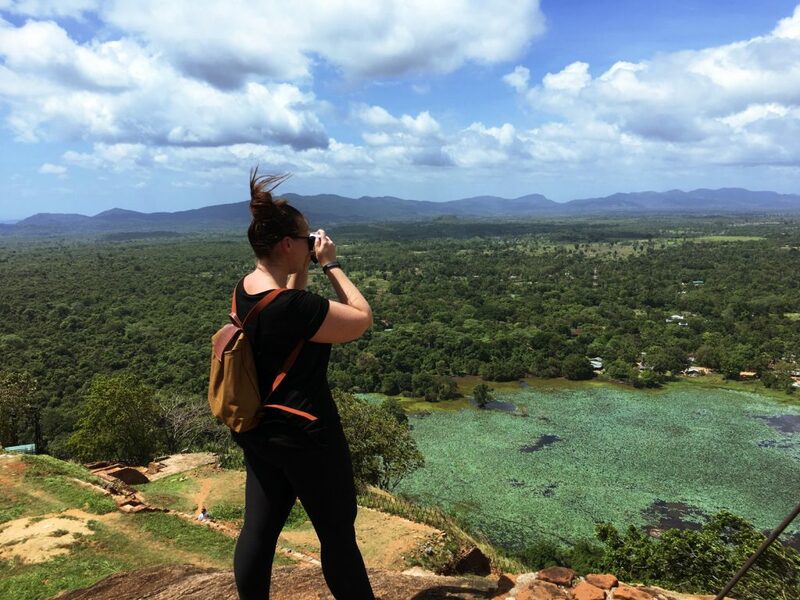 For information on how to get to Sigiriya from Colombo check out this advice by a local blogger. This is #1 on my list of things to do once I’m in better shape…your photos are gorgeous! Wowzer! Your pics are incredible – that view!! 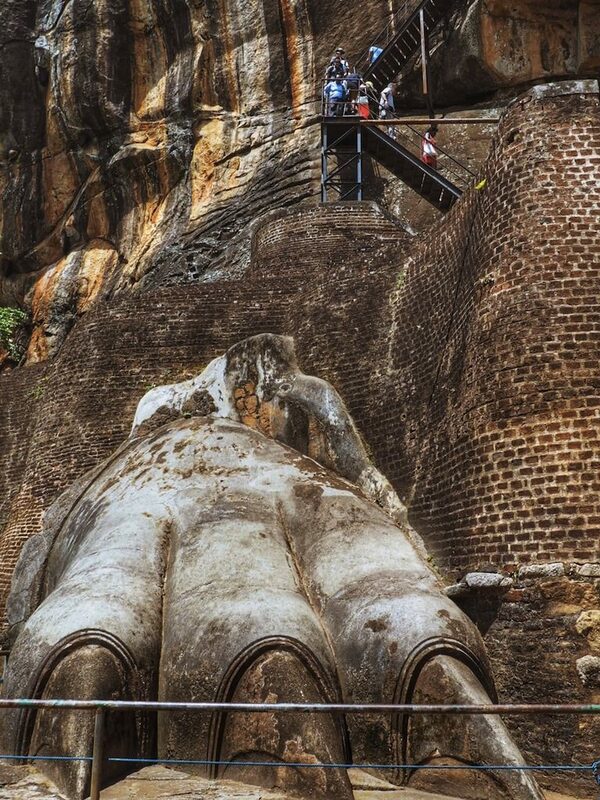 I’d love to go to Sri Lanka one day, it looks like such a beautiful country. Awesome post! 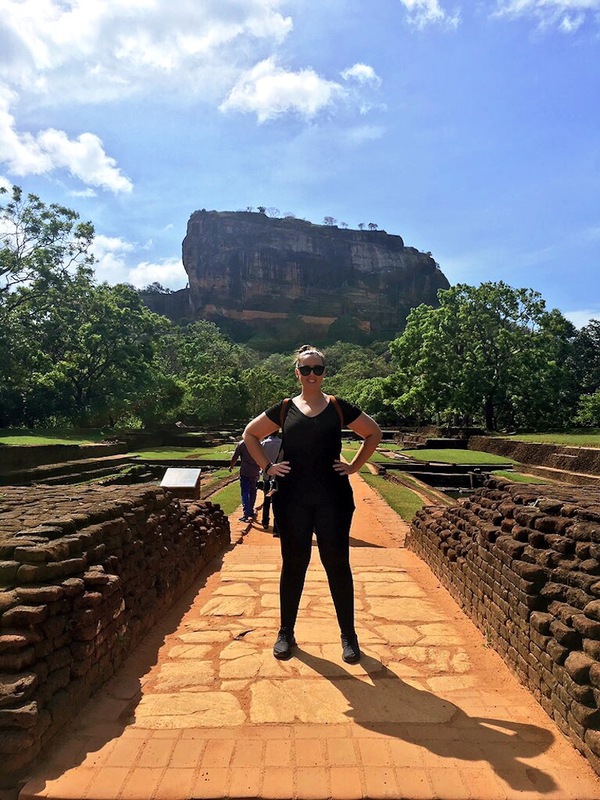 How did you recommend getting to Sigiriya?! Looks awesome and sounds like you had lots of fun. I’m researching for my trip and was wondering if the steps are steep and narrowish, I’ve a phobia for heights but if it’s stable and have supports around I think I might be able to do it. Your advice? Hi David, there is a section that is quite rickety – ie the steps are metal and you can see straight through them – and some sections can be busy so it’s a squeeze to let people pass. I saw all ages and abilities giving it a go but if you’re afraid of heights it might make you feel a bit wobbly! Oh awesome! Best of luck. Hope you have fun. 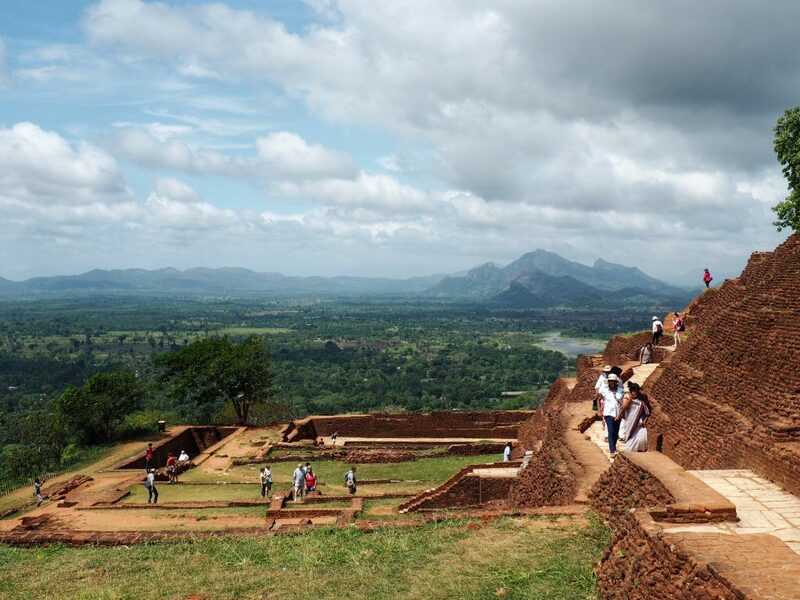 What time of the year would be the best for visiting Sigiriya? Can I were shorts and normal tshirt to climb the rock, I am female? Hi Evelyn, as it’s not a religious site there is no dress code but the locals do tend to dress more conservatively in long skirts. Most of our group opted for long trousers and t-shirts.